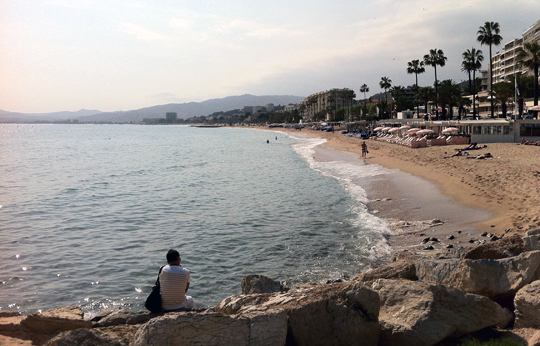 As you may have gauged from the minimal amount of activity taking place on here at the moment, I am now situated in Cannes. 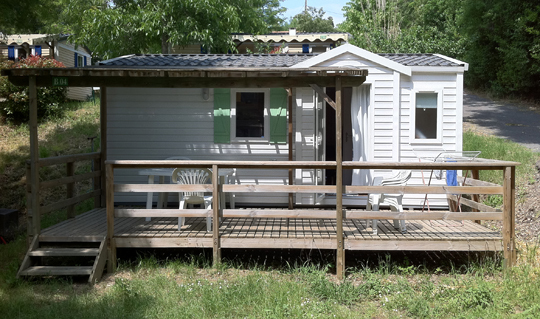 Along with a small group of carefully selected friends (Malick, Von Trier, all the usual faces), I’m staying in the small caravan pictured above, a couple of miles from the Croisette. It may not have the breathtaking views of the Weinsteins’ penthouse suite, but it has got a bottle opener, some wonky patio furniture and fairly reliable WiFi access within a 5-minute walk. We arrived on Sunday morning and spent most of that day in a hazy half-asleep stupor. All the shops were closed for a French national holiday so we scrounged together a few odds and ends from the one available supermarket, ate some pasta and fell asleep at 9pm. 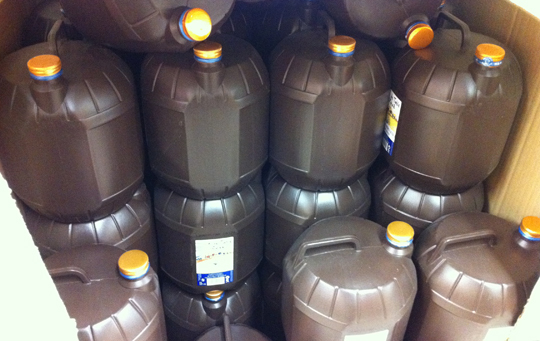 5 gallons of wine – €5. It’s a madness. What next? Biscuits in wine bottles? 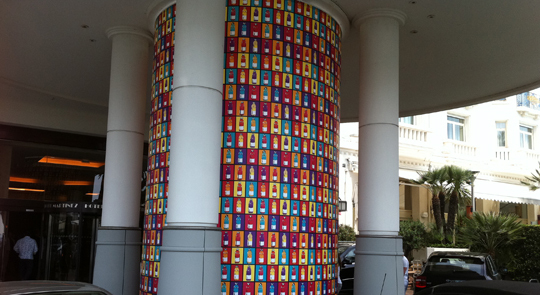 Milk in tubes? 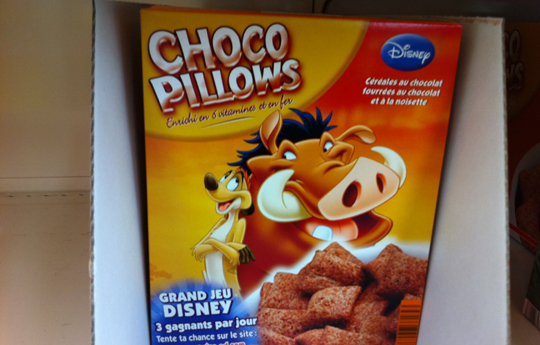 Choco Pillows? 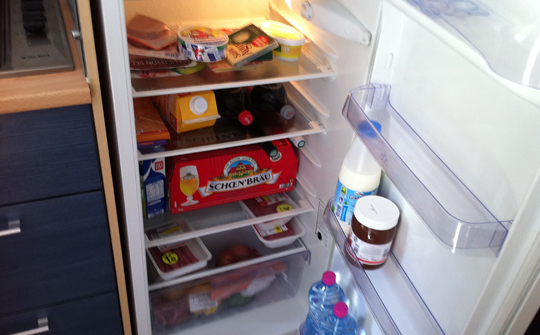 We unloaded our purchases into our now pleasingly plentiful fridge (Nutella in the side compartment, Snickers in the chilla) and headed out into the magical world of Cannes, which is still a relatively quiet magical world compared to what I’m told to expect come Wednesday. 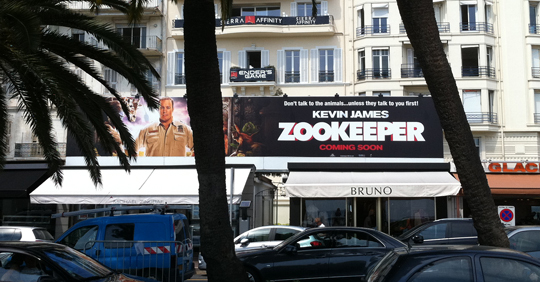 Nonetheless, the Croisette is abuzz with preparatory fiddling, from workmen laying down the carpet on the big famous staircase to the hourly arrival of new posters flaunting major studio offerings from the next six months… and Zookeeper. I don’t know… you travel 800 miles and it’s still less than 24 hours before Kevin James is all up in your grill. 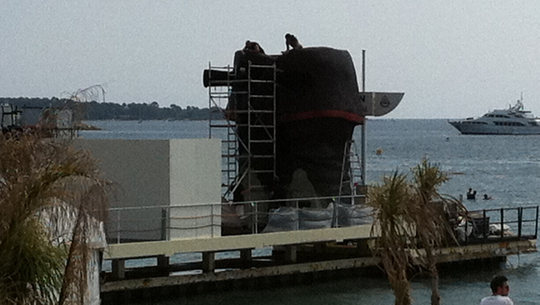 Elsewhere, a pair of giant pirate boots were being erected on a pier, presumably as part of some kind of massive Jack Sparrow (the fourth Pirates film has its premiere here in a few days time). It’s hard to make out in this photo, but the look on the workmens’ faces said ‘Jack Sparrow simply doesn’t work as a lead protagonist’. 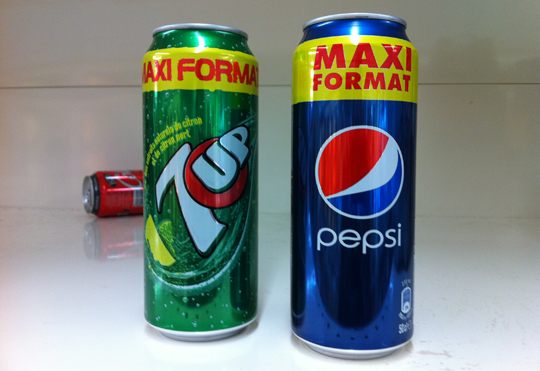 Seriously, is nowhere safe from the wrath of nauseating sugar water? I mean, there’s an obviously irony in the desperate attempts of Stella Artois to buddy up to the festival and hopelessly reinforce their ‘sophisticated’ image, but at least you can drink a Stella without retching up your own guts in the process. 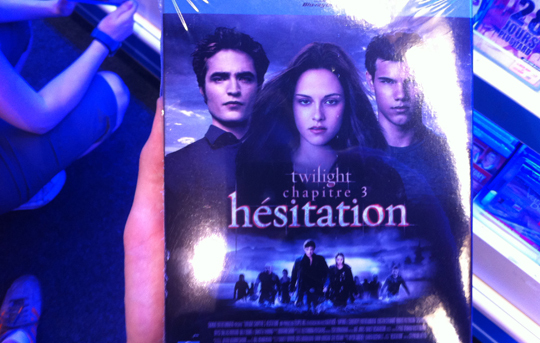 We’d forgotten to bring suntan lotion and our pale bodies were getting funny looks from the ludicrously tanned locals, so we ducked into a French HMV-a-like called FNAC to peruse the exciting region-specific goodies on offer. 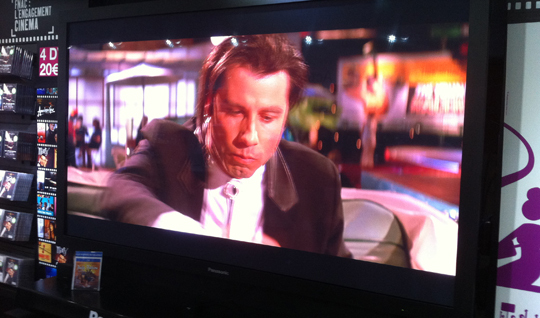 They had the biggest TV I’ve ever seen in my life, which was playing a Pulp Fiction blu-ray in the early afternoon like it was no thang. Abandoning Vince and Mia, we went upstairs to the ‘disque’ section and starting seeking out rarities. I was particularly interested in locating the French blu-ray of Enter the Void (which contains both cuts of the movie in HD, unlike our pathetic standard definition theatrical cut DVD) and MK2’s Lost Highway and Fire Walk With Me blus, both the sole HD versions of said movies. 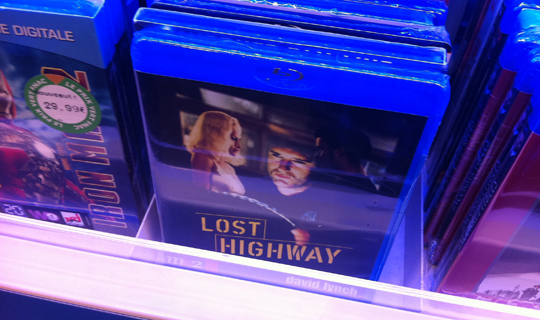 I found Lost Highway in the end, but it was €33 (€33!) so I reluctantly resolved to check out amazon.fr when I got home and leave the precious disc in its cyan-drenched display stand. Still, it’s no 161-minute cut of Enter the Void in blistering 1080p. 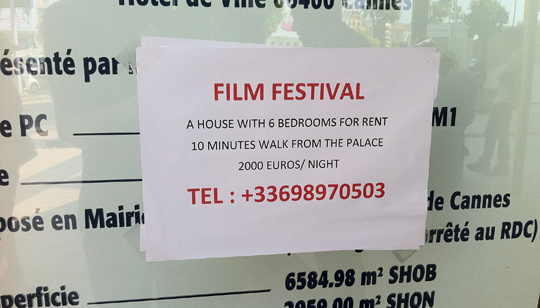 The festival begins tomorrow with the world premiere of Woody Allen’s Midnight in Paris. I’m not sure whether or not I’ll be seeing it because it’s hard to get into and I couldn’t possibly care less, but either way I’ll keep you updated.